CD-recorders have all but replaced floppy disks for portable storage. But it's not economically feasible to buy every employee a CD-R burner, not to mention that network support for the complex devices can quickly become a nightmare. Could MediaForm Inc.'s CD Director be the answer? Billed as a CD-R duplication product for enterprises, it has six high-speed CD-R drives, a thermal printer for labels, hard drives to store duplicated images and a robotic arm that places the CDs in the correct drives. The CD Director's local interface operates from a computer running Windows NT 4.0. At its peak, the device burned 49 640M CDs in one hour with its 12X burners. The unit arrives in several pieces but fits together fairly easily. The typical setup takes about an hour. Company officials said they will send a representative to the customer site to help out. At $36,000 per unit, you don't want to risk damage from an incorrect setup. The MediaForm CD Director must sit on a stable surface because any movement could cause the robotic arm to drop CDs in the wrong locations. I accidentally jarred the receiving stack pole out of place, and CDs began spilling over the inside as the robotic arm dropped them where the pole was supposed to be. I'm surprised it doesn't screw into the base for better support. In my test unit, it merely rested on a little washer. Once set up, the CD Director boots just like a computer running Microsoft Windows NT 4.0. My test unit had one 6G hard drive and six 2G drives, more than enough to archive several CDs locally. But it's not just for archiving CDs. With a little coding, CD Director also can burn CDs of records from data on your servers. You create an image file of the desired data and then burn the image to a CD-R disk. If you know how to code scripting languages, you can have CD Director publish different CDs for different people, for example, disks of each users' files archived on network servers. This makes it a publish-on-demand tool, as well as a duplication server. The robotic arm activates a vacuum switch to pick up disks. It failed to grab hold only twice in 200 turns. CD Director must sit on a stable surface to avoid jarring the arm. The unit's 266-MHz processor coped well when GCN Lab reviewers sent it multiple jobs simultaneously, both from the local keyboard interface and from the Internet. At peak capacity, the unit burned 49 640M CDs in an hour with its 12X burners. That included time for making the image files, resetting the arm and printing labels. As for management capabilities, the unit can complete important jobs, or jobs for important users, ahead of lower-priority tasks. CD Director mostly lives up to its billing as an all-in-one product. The weakest function seems to be printing and labeling, which is fairly primitive. The software interface at the local computer was easy to use, for example, to print 'Copy of database 3' on a disk, but anything fancier took excessive time. The software can import bitmap files, logos or photos. I would prefer a paintbrush program for better-looking label designs. 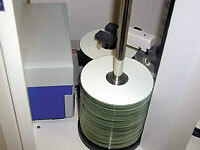 The printer had trouble with some media, including about 50 of the test disks. Ink would not stick to the white surfaces. Blank CDs with clear surfaces held ink better. The significance of CD Director for an enterprise is not in the quality of the local interface, however, but in the fact that networked users can access the device through a spare Ethernet port via their browsers and a Java interface. I found Netscape Navigator worked better than Microsoft Internet Explorer. The Java interface has the same functions as the local interface. I encountered minor glitches such as windows that refused to close once status meters reached 100 percent. Company officials said a new version of the Java interface is in the works. I sent a job from a high-priority networked Java user just after a low-priority local user had requested duplication of several CDs. The remote user's job went to the top of the list, though the unit would not stop performing the lower-priority jobs once begun. Besides speed, accuracy is important in any duplication device. The lab staff burned more than 200 CDs'a mix of data and audio duplications from masters plus general files from the server. 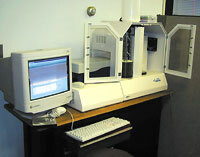 The lab team randomly selected about 25 percent of the disks for extensive review and found no errors. CD Director's learning curve is fairly steep because you must know scripting language for the dynamic burning capabilities. Even basic functions took a bit of study. One job got stuck in the status window even though the robotic arm had physically ejected the disk. The fix was easy enough: I simply deleted the temporary job file from the hard drive. But the documentation did not discuss how to handle such a problem. CD Director does a good job of centralizing CD-R burning operations. It's accurate and fast enough for a network of users. And an administrator would have only one device to manage, occasionally monitoring the input and output CD stacks to see when they are empty, instead of troubleshooting multiple individual CD-R burners.